The Marines, Marine Corps or the Naval infantry are the special force the U.S. and other countries army operate on the sea. In the majority of countries, this special force is a branch of the navy, but there are some exceptions. These are France and Israel, which assign these forces under the army. Apart f rom the naming and the branch appurtenance, the duties of a professional sailor are the same. The duties of operations for the marine troops cover the littoral zone, up to the distance of 50 miles inland, or as far as the ship members and logistics can cover and secure. The trained personnel for these actions deploy in the wildest and coolest ways: from boats, hovercraft, helicopters, amphibious vehicles, or landing crafts. The Marines are also trained in parachuting, combat diving and combat swimming. The job description covers just about what James Bond does in the movies, but these are real life exercises. Among the daily basis job descriptions, the marines help with the maintenance of discipline and order on the ship, or maintain the order in the case of capturing other prize ships or prisoners. Almost all of the countries with opening to the sea have a naval force. Some of the most renowned are the US, France and Spain. 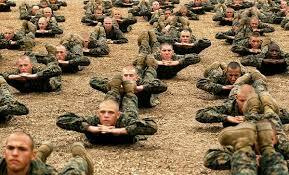 The US Marine Corps, USMC, is the largest marine force on the planet. It was created in 1775 with the intention to guard the vessels of the Navy in times of the American Revolutionary Wars. Some of the most special tasks of this infantry is to provide protection for the diplomatic missions and to provide transportation by helicopter for the US President and other diplomats aboard Marine One. Marine One is the nomination of any aircraft of this division transporting the President. The French Marines are the only troupes of the French Army allowed to have a permanent base in Africa, while the Spanish is the oldest of its kind in the whole world, being established in 1537 by the King Charles I.